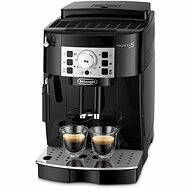 Automatic espresso with a pump pressure of 15bar and a built-in coffee bean grinder (with 13 grinding settings). The posibility of using a gound coffee instead is a commonplace. The device can be used to prepare one or two cups of coffee with a single brewing. It is possible to adjust the water and coffee quantity. There is also a jet whipping for a creamy froth. Cup heating function and self-cleaning function is to great advantage, too. Adjustable coffee dispenser serves for using varyous sizes of cups. 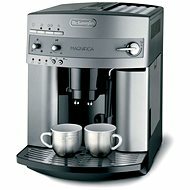 with a steam jet, Cup heater, Adjusting coffee amount, Prepares two cups at once, Coffee grinder, Self-cleaning system Done! 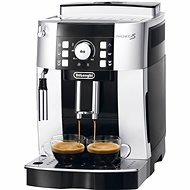 For shipping to other EU countries visit this page De´Longhi ESAM 4000. Für Versand nach Deutschland, besuchen Sie bitte De'Longhi ESAM 4000. Chcete doručit zboží do Česka? Prohlédněte si De'Longhi ESAM 4000. Chcete doručiť tovar na Slovensko? Prezrite si DéLonghi ESAM 4000 Magnifica.